In 1957, when Fuller’s first son was 18 months old, she afixed a wood plank to her external frame pack and strapped her baby to it with three leather belts. Then, with her husband Wayne, the California transplant set out on her first hike in Idaho’s craggy Sawtooth Mountains: a seven-mile trek up 1,200 feet to a string of sapphire lakes. With Wayne at her side, she stared at the reflection of blond peaks, hummed to her baby on her back, and inhaled the fresh aroma of pine. In that moment, she was hooked–on exploring the range, on improvising her own gear, and on defying expectations of what a woman of her generation should do or be. Trails of the Sawtooth and White Cloud Mountains is now in its fifth edition, which Fuller updated in 2011 with GPS coordinates for the trailheads. 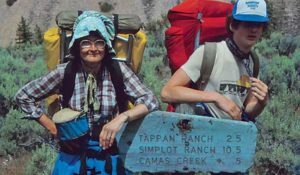 She’s hiked more than 6,000 miles during the last three decades, which helped her to complete seven more books, including the one-and-only trail guide to the infamously remote and rugged Frank Church-River of No Return Wilderness. >>Stay focused with every step. The worst trail accidents I’ve seen are when a hiker goes too fast downhill or crosses a creek inattentively. Play games with kids. We used to run ahead and put Lifesavers and M&Ms on the rocks for the young ones to find. You can also stop and read from a book at every mile or so. >>Constantly evaluate your gear. After every trip, I ask myself if there’s anything I didn’t use. After 30 years, I’ve learned I never need kitchen utensils, extra clothing, or a pillow. >>Share your knowledge. Contact local hiking and service clubs (and gear shops) and volunteer to lead hikes or give free slideshows for them. Sharing quality information about trails is the best way to get more people outside. >>Trust print. Online hiking forums without maps are great for conditions updates, but they’re generally not as accurate as I’d wish. With guidebooks, you know a pro has dedicated time to accuracy and clarity. >>Explore without a guidebook sometimes. You’ll discover new and beautiful places that most people don’t know about. Make sure you take a topo map, compass, and GPS unit with you. >>Never stop hiking. That’s my secret to staying in shape. I may be slower now, but I still keep a target of 10 miles a week on hills, as well as calisthenics every other day.